Willcom, Microsoft and electronics maker Sharp are teaming up to deliver a corporate-targeted PDA WLAN handset for the Japanese market that will incorporate Windows Mobile 5.0 as its operating system. Scheduled for a December release, the W-Zero3 will operate over Willcom’s PHS (personal handyphone system) network. Equipped for both voice and data, the handset makes full use of its Microsoft connection to juggle an assortment of PC-based functions over its handy slide-out QWERTY keyboard in addition to the standard mobile touch pad. Users can access PC-based email addresses, edit Microsoft and Excel documents on a bright, 3.7-inch VGA touch screen (the unit comes with a PDA-style stylus) and thumb through Excel, Word, PowerPoint and PDF files. All this computing power is tough on battery life; talk time is only about five hours. The camera unfortunately is just adequate at 1.33 megapixels. Willcom’s corporate target market is right in line with Microsoft’s Asian expansion plans for their Mobile 5.0 system. In September the company scored a deal in the US with PDA maker Palm. 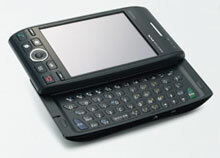 Palm has licensed the Microsoft Windows Mobile operating system for an expanded line of their Treo Smartphones, the first of which [ .jpg image ] will be available on Verizon Wireless’ national wireless broadband network. In Asia 3G phones with PC flexibility built-in are becoming the standard and Microsoft needs to exploit this mobile market. This first deal in Japan signals the company’s targeted push in Asia. Next month Willcom will debut their new four-PHS mobile handset line-up with many of the same functions as high-end models from the competition. Functions for these include a PC document viewer, NetFront V3.3 internet browser, Intellisync for Outlook, fingerprint authentification, music player, pixel reader, macromedia flash, even Bluetooth. Many analysts had written off the PHS system but thanks to low cost fixed-rates for voice and data PHS numbers are on the rise especially with business users. The company is introducing an extremely attractive flat rate for their new high-end phones: a flat rate mobile data fee of just 3,800 yen ($33) a month. Flat rates for data and voice total only about 6,700 yen ($58) a month. Willcom had a total of 3.36 million subscribers as of August.